If you are going through a divorce, consider updating your will to ensure there are no problems when the will is probated. Texas law recognizes that people don't usually intend to leave their property to a former spouse, so any references to the former spouse in a will are essentially erased. However, you may want to leave your property to your children or another relative, so updating your will can ensure they receive the property intended for them. 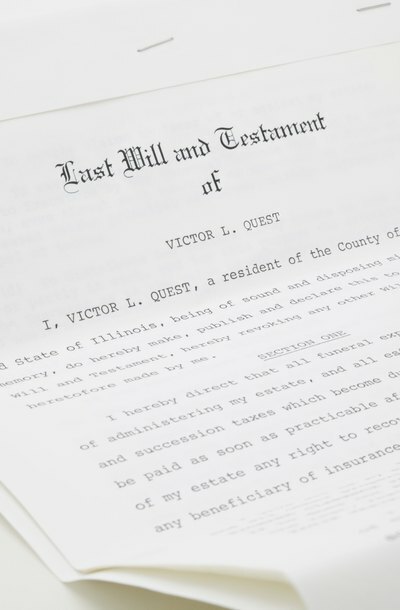 The Texas Probate Code states that any bequests or gifts left to your former spouse in a will made during your former marriage will be treated as if that person died before you did. This provision essentially cancels out any gift you left to your former spouse. It also cancels out gifts left to relatives of your former spouse, including her children and parents. For example, if you executed a will during the marriage that made your former spouse the primary beneficiary and your brother the alternate beneficiary, your brother will be the primary beneficiary after the divorce. The executor of an estate gathers the estate's assets, pays its debts and distributes gifts to the people named in the will. After a divorce, any provisions naming your former spouse or any of her relatives will be read as if those people did not survive you. For example, if the will named your former spouse as executor and your stepson as alternate executor, the court will appoint someone else to serve as executor. You can change your will as often as is necessary during your lifetime to reflect your wishes and current situation. In the case of a divorce, you may wish to have the entire will redone. Another option is to attach an amendment, known as a codicil, to the original will. If you remarry, you must make a new will if you want to leave property to your new spouse. Some people may want to leave gifts to their former spouse, in-laws or stepchildren after a divorce. In that case, you can make a new will after the divorce is final and include your former spouse and others if you wish. Although Texas allows handwritten wills, they may be misinterpreted. For the best results, have the will typed, witnessed and notarized. A self-proving affidavit witnessed by two parties and notarized will demonstrate to the probate court that the document is valid as your last will and testament. After a divorce, you should review your life insurance and trust documents to reflect your current situation. If you originally designated your former spouse as a beneficiary, she will not be considered a beneficiary after the divorce. If you still want your former spouse to receive life insurance proceeds after the divorce, you should either include that information in the divorce decree or re-designate your former spouse after the decree was granted. Another possibility if you have young children is to set up a trust to hold your life insurance policy for your children. You can do the same for your employee stock options, savings plans and individual retirement accounts. Can a Notarized Will Be Accepted as a Legal Document in North Carolina? A will is a valid legal document in any state, provided that it meets the laws and qualifications of that jurisdiction. In North Carolina, requirements for legal wills appear in Chapter 31 of the state’s General Statutes. Your will does not have to be notarized for it to be a valid, legal document. Even if it is notarized, it may not be valid and legal unless it meets the state’s other requirements. You can use a will to accomplish many purposes, including naming guardians for your children, leaving specific bequests to your loved ones and nominating someone to manage your estate until it can be distributed. Though it is typically wise to update your will as your circumstances change, you can include provisions for your unborn children as well as living family members. In your will, you name an executor, the person who will manage your estate according to the distribution instructions that you also provide in your will. If your will meets your state's requirements, the probate court will uphold it and the executor becomes legally bound by its terms. He will have to give your property to the persons you named as the recipients of the property in your will. If you change your mind after you make your will, you must change your will or make a new one. Otherwise, people you don't want to inherit from you will receive property from your estate.